The commemoration of the 150th anniversary of the 1857 rebellion has generated tremendous excitement all over the country. The thesis of the British colonial masters that it was merely a mutiny of the sepoys has been generally repudiated, with the notable exception of a small minority of pro-colonial historians. Most historians agree that instead of the mutiny, the events of 1857 had all the elements of a mass rebellion and that this rebellion was mainly led by an urge for national liberation from the British rule. The 1857 rebellion was not also a short term affair. Its prolonged character can be understood by knowing that though Delhi had fallen in the last week of September 1857, the British masters were not able to suppress it in rest of India till 1860. In fact, in Terai region of Awadh and parts of central-western India the rebellion continued for couple of years more. While this picture more or less reflects the consensus, an ambiguity arises about the role of Sikhs in the rebellion. It is generally believed by both lay people and renowned historians that Sikhs not only kept aloof from this upsurge but also helped the British in suppressing it by joining the colonial army. Surprisingly, even well-known Sikh historians continue to hold the same belief. Even researchers who believe that people of different religions joined hands in this rebellion to overthrow the British rule keep Sikhs out of it. For them, Hindus and Muslims alone united in this rebellion. While Hindus and Muslims did rise up together in 1857, why we exclude and ignore the role of Sikhs in the 1857 rebellion is quite puzzling. The evidence shows that Sikhs joined in this rebellion and stood shoulder to shoulder with Hindus and Muslims. 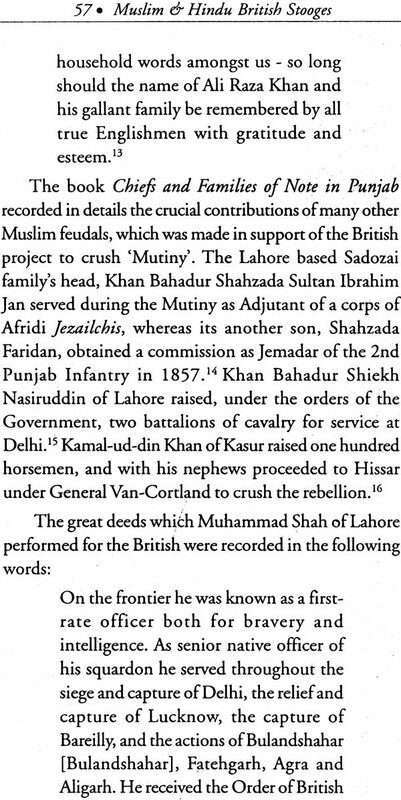 The rebel war council which was established in Delhi immediately after the declaration of independence on May 11, 1857 noted that among the rebels were Hindus, Muslims and Sikhs in Delhi and elsewhere. Surendranath Sen in his monumental work on the rebellion titled 1857 admitted that 'if there were Sikhs on the Ridge [with the British] at Delhi, there were Sikhs inside the city [with the rebels]'. However, the myth that Sikhs as a community betrayed the 1857 rebellion continues. I have myself experienced the pervasiveness of this myth among experts while participating in various conferences on the rebellion. This book attempts to examine the role that the Sikh community actually played in the rebellion of 1857 with the help of documents from the time. In the course of my research, I have unearthed hitherto unknown documents including British official records of the mutiny and narratives of both the British and Indians who witnessed rebellion. These documents demolish the myth that Sikhs either kept aloof from the rebellion or helped the British as a community. If there were pro- British Sikhs there were also anti-British Sikhs, and the same could be said for any religious community of the time. I am immensely grateful to my wife, Neelima Sharma, who not only helped me in the procurement of rare documents but also in organizing them. I am also thankful to my daughter, Shirin and son-in-law, Sameer Dossani who as always enrich me with their critical comments. I am grateful to Professor Randhir Singh, Dr. 1. K. Shukla, Mr. Shyam Chand, Mr. Sharfudheen M. K., Dr. Amar Farooqi, Dr. S. P. Shukla, Dr. Prem Singh, Mr. Vageesh Jha, Mr. Braham Yadav, Dr. Badrul Islam, Dr. Goura Kudesia, Dr. Shakil A. Khan, Dr. Anurag Sharma, Dr. G. D. Gulati, Dr. Navtej Singh, Mr. Pankaj Chaturvedi, Dr. Pragya and Dr. Rakesh, Ms. Sunita Yadav, Dr. Suresh Mishra, Dr. S. N. Khan Shahid and Mr. Ted Svensson for their valuable suggestions.